A massive chemical company, a payroll processor, and a insurance/financial services provider are three of the most recent firms hiking their shareholder distributions. The holidays are coming, and investors would like nothing better than to be gifted a dividend raise from one of their stocks. Dividend hikes are the gifts that keep on giving. Not only do they put extra money directly into a shareholder's pocket, but they often boost the price of the affected stock. This is because the market is willing to pay that much more for the extra payout. Companies that improve their long-term fundamentals typically have extra resources to add to their distribution over time. With that in mind, here is a selection of three stocks that upped their distributions last week. The largest American chemical manufacturer has handed out quarterly dividends for over 100 years. Upholding that tradition, last week Dow declared an upcoming payout of $0.42 per share -- a 14% increase over the previous dividend of $0.37. The firm hasn't raised its distribution as often lately, although when it does, it tends to be generous. Since the beginning of 2009, it has hiked its dividend four times for a total difference of $0.15 per share. Like many dividend-paying stock market behemoths, Dow is fairly conservative when it comes to its distribution policy. What it pays out is easily covered by the cash it generates from its operations. DOW Total Dividends Paid (Quarterly) data by YCharts. At the moment, Dow's locked in a battle with activist investor Dan Loeb's Third Point hedge fund over the future direction of the company. But this is a company that's big on tradition, and it has the means and desire to keep those dividends flowing to shareholders no matter how ugly the fight gets and how severe the repercussions. Dow's new dividend is to be dispensed on Jan. 30 to holders of record as of Dec. 31. This provider of payroll outsourcing related services is a dividend aristocrat -- one of the few S&P 500-listed companies that have raised their distributions at least once per year for a minimum of 25 years running. And It's staying in the club with last week's announcement that it is to lift its distribution slightly, by $0.01, to $0.49 per share. 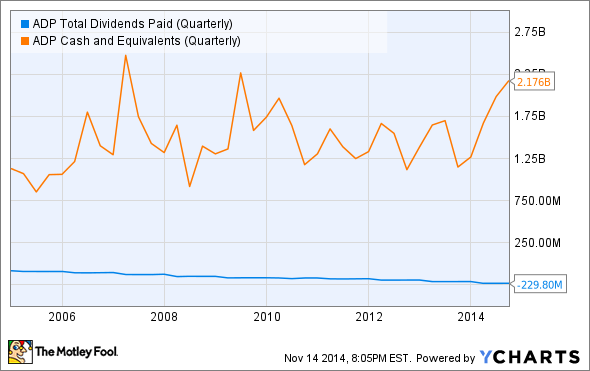 Automatic Data Processing likes to hike its dividend at the end of every year. This isn't one of the more generous raises; in both 2012 and 2013, the company increased the payout by 10%. 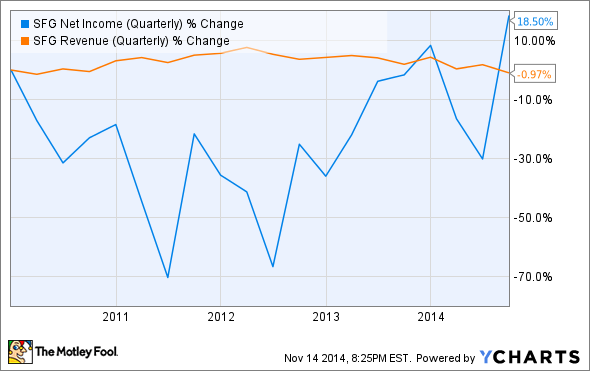 Regardless, ADP's dividend continues to look safe. Over the past four years, the company's top and bottom lines have been on the rise. Cash and equivalents are relatively plentiful: At the end of the most recently reported quarter, they stood at a collective $2.2 billion -- more than enough to take care of the $230 million the firm paid in dividends. 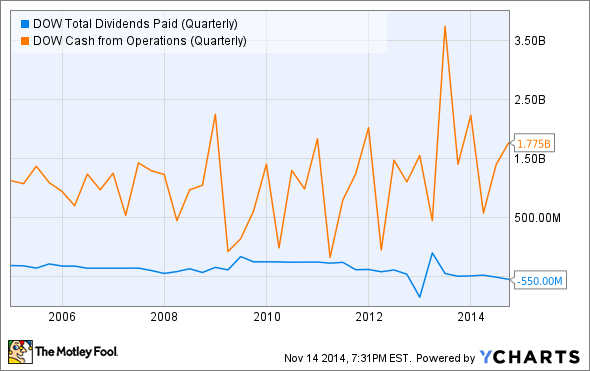 ADP Total Dividends Paid (Quarterly) data by YCharts. Automatic Data Processing's new distribution is to be paid on Jan. 1 to shareholders of record as of Dec. 12. Insurance and financial services company StanCorp Financial Group hands out its distribution once per year. It's that time of year for StanCorp, and this year's payout represents a substantial raise: The firm declared a $1.30 per-share dividend -- a meaty 18% higher than the 2013 payout of $1.10. StanCorp likes to add to its distribution. Since down-shifting from quarterly to annual dividend payments in 2001, the company has raised its dividend every year (factoring in a 2005 stock split). Fortunately, StanCorp has the room to do so. A glance at its 2013 annual report reveals that the company had cash and equivalents totaling $161 million at the start of the year and paid out a comparatively modest $48.5 million in common-stock dividends. Meanwhile, StanCorp's most recent quarter was a good one, with increased profitability on the back of revenue that's been more or less steady. The higher bottom line will add cash to the company's coffers, auguring well for the future of its dividend. SFG Net Income (Quarterly) data by YCharts. StanCorp's 2014 dividend will be handed out on Dec. 8 to shareholders of record as of Nov. 24. This week's trio of dividend raisers are companies that have developed the encouraging habit of raising their distributions on at least a semi-regular basis. All three look relatively certain to continue doing so in the future. Their investors won't be disappointed with the new gifts they're being delivered in the early days of this holiday season.